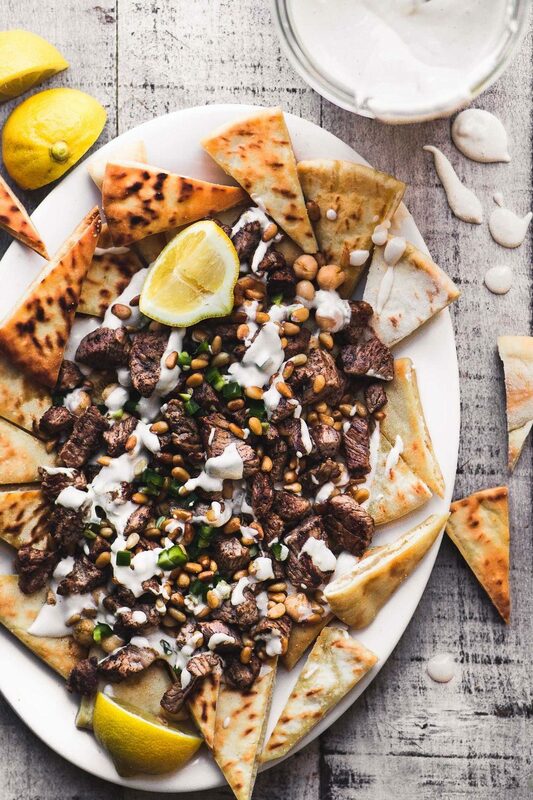 These Middle Eastern 'Nachos' are my take on one of our favorite appetizers, perfect for Game Day snacks or a romantic dinner for two ~ you decide! Cut each pita round into 4 quarters, and then cut each quarter into 3 triangles. Lay the bread out in a single layer on a baking sheet. Lightly brush the top of each triangle with olive oil, and then sprinkle with onion salt. Bake for about 8-9 minutes, or until golden. Flip, and bake for another 4-5 minutes. Let cool and then arrange the pita triangles in a single layer on a serving platter. Put the chickpeas in a small saucepan and cover with water. Bring to a simmer, then turn off the heat, cover, and set aside to keep warm. Whisk together the tahini sauce ingredients, adding the 1/3 cup water to loosen it up to make a thick but pourable sauce. Add more water if necessary. Taste to adjust the salt or lemon juice. Cut the steak into small 1/2 inch cubes. Season with the baharat spice. Heat a heavy skillet on medium high until quite hot. Add a small amount of olive oil to the pan and then, working in 2 batches, brown the meat, letting it sear on the first side, and then shaking it around to brown it all over. You're looking for some good color on the beef, so make sure you've got a pretty high heat. This will only take a few minutes. Drain the chickpeas well, and spoon them over the pita chips. Sprinkle them liberally with the cumin. Follow with a layer of the tahini sauce, and then add the meat. Top with the toasted pine nuts and another drizzle of the sauce. Scatter the jalapenos over all.